Fig. 2: A residential rooftop PV system. 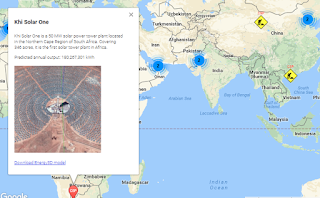 If you care about finding renewable energy solutions to environmental problems, you probably would like to join an international community of Energy3D users to model existing or design new solar power systems in the real world and contribute them to the Virtual Solar Grid — a hypothetical power grid that I am developing from scratch to model and simulate interconnected solar energy systems and storage. 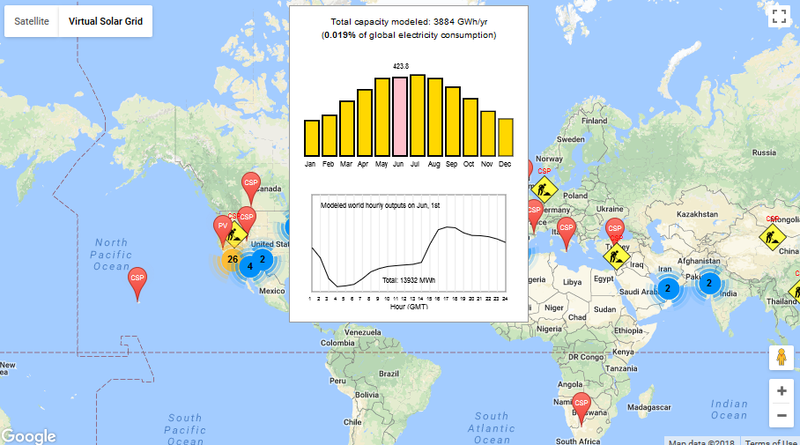 My ultimate goal is to crowdsource an unprecedented fine-grained, time-dependent, and multi-scale computational model for anyone, believer or skeptic of renewables, to study how much of humanity's energy need can be met by solar power generation on the global scale — independent of any authority and in the spirit of citizen science. I have blogged about this ambitious plan before and I am finally pleased to announce that an alpha version of the Virtual Solar Grid has come online, of course, with a very humble beginning. Fig. 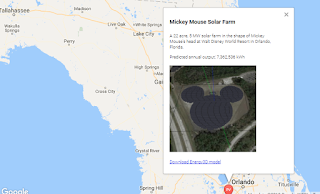 3: The Micky Mouse solar farm in Orlando, FL. Fig. 4: NOOR-1 parabolic troughs in Morocco. As of the end of January, 2018, the Virtual Solar Grid has included 3D models of only a bit more than 100 solar energy systems, ranging from small rooftop photovoltaic solar panel arrays (10 kW) to large utility-scale concentrated solar power plants (100 MW) in multiple continents. 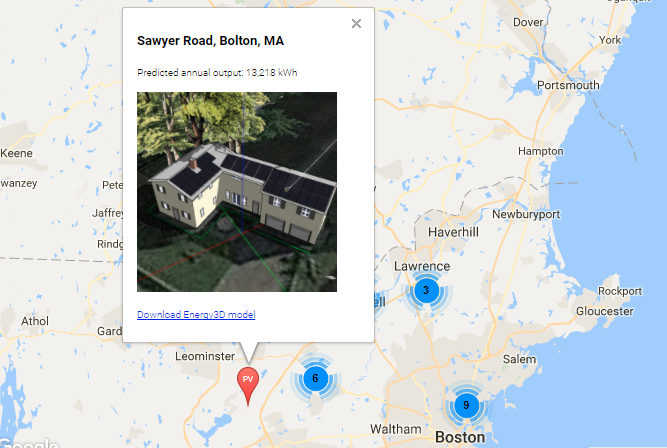 At present, the Virtual Solar Grid has a lot of small systems in Massachusetts because we are working with many schools in the state. 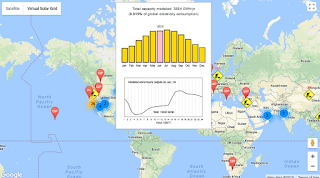 With this initial capacity, the Virtual Solar Grid is capable of generating roughly 4 TWh per year, approximately 0.02% of all the electricity consumed by the entire world population in 2016 (a little more than 2 PWh). Although 0.02% is too minuscule to count, it nonetheless marks the starting point of our journey towards an important goal of engaging and supporting anyone to explore the solar energy potential of our planet with serious engineering design. In a sense, you can think of this work as inventing a "Power Minecraft" that would entice people to participate in a virtual quest for switching humanity's power supply to 100% renewable energy. Fig. 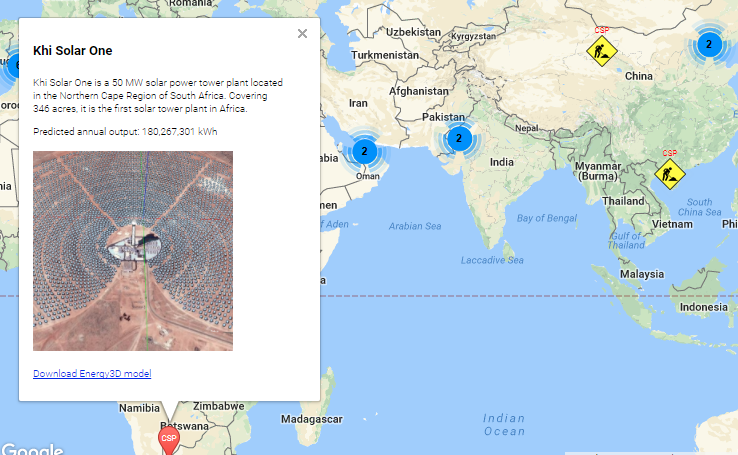 5: Khi Solar One solar power tower in South Africa. Fig. 6: PS 10 and PS 20 in Spain. The critical infrastructure underlying the Virtual Solar Grid is our free, versatile Energy3D software that allows anyone from a middle school student to a graduate school student to model or design any photovoltaic or concentrated solar power systems, down to the exact location and specs of individual solar panels or heliostats. 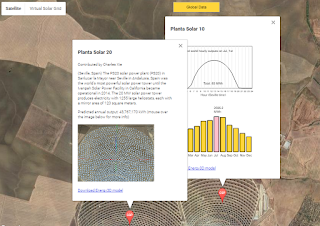 Performance analysis of solar power systems in Energy3D is based on a growing database of solar panel brand models and weather data sets for nearly 700 regions in every habitable continent. To construct a grid, micro or global, an Energy3D model can be geotagged — the geolocation is automatically set when you import a Google Maps image into an Energy3D model. 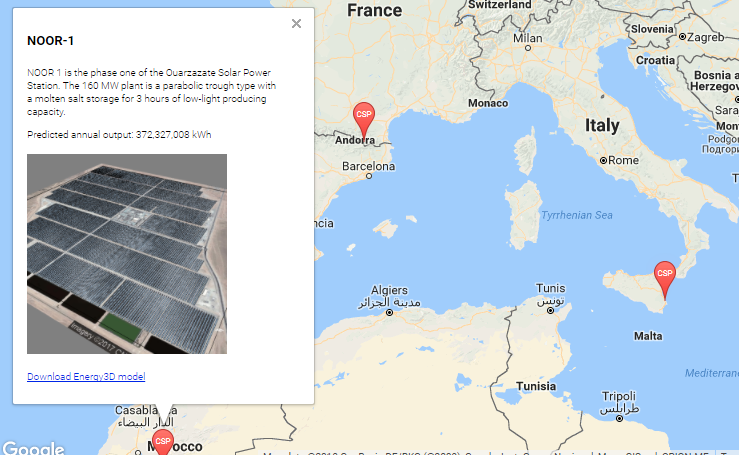 Such a virtual model, when uploaded to the Virtual Solar Grid, will be deployed to a Google Maps application that shows exactly where it is in the world and how much electricity it produces at a given hour on a given day under average weather conditions. 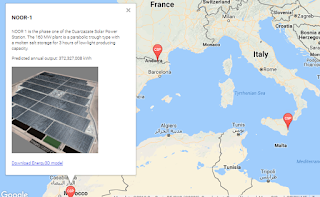 This information will be used to investigate how solar power and other renewables, with thermal and electric storage, ca n be used to provide base loads and meet peak demands for a power grid of an arbitrary size, so to speak. Finally, it is important to note that the Virtual Solar Grid project is generously funded by the U.S. National Science Foundation through grant number #1721054. Their continuous support of my work is deeply appreciated.